Hey y'all! I hope you're having a great start to your week! We are officially less than two weeks away from our Disney World vacation! I booked this trip last spring and it has felt like it's taken forever to get here but now we are just days away from a magical trip. In case you missed it, my husband and I are surprising our daughters on Christmas morning with news that we are leaving right then to head to Florida for a week long Disney adventure! We took them last summer for a few days and they have talked about the "best trip ever" nonstop so I am so excited to take them back. Today, I'm sharing eight items that I purchased for the trip. I learned that hard way during our last trip that comfortable shoes are seriously essential. You won't survive all of the walking with any sort of foot pain! So my number one item is comfortable shoes. Our last trip was in the summertime so planning outfits for this trip has been a little more challenging for me because I'm not really sure what to expect weather wise so if you have been to Disney in December, please share any suggestions on what to pack or anything else I might to need to know about going to Disney this time of year. 1. Nike Sneakers | These shoes are a must have for lots of walking! I've shared them before but they are seriously the most comfortable shoes I have ever owned. I wear them to workout and to work. They are the best! I'm even buying my girls the kids version to be sure that their feet are also extra comfy too while we are at Disney World! 2. Castle Home Tee | I have a North Carolina tee from this brand and I love the fit. I literally wear it once a week! When I saw this adorable castle version, I knew I had to have it for our trip! 3. 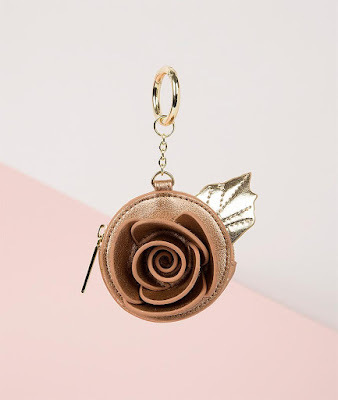 Rose Coin Purse | I love all things Danielle Nicole and I couldn't resist picking up this adorable coin purse to add to my Mickey Mouse backpack. Beauty and the Beast is my all-time favorite Disney movie! 4. 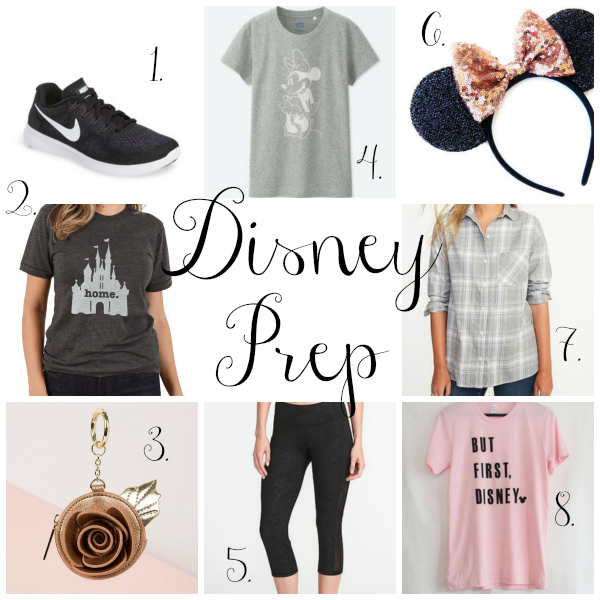 Minnie Mouse Tee | I love a gray tee so I scooped this one up too and it was under $10. I also found my husband a cute Mickey tee from the same company for a great price. 5. Cropped Leggings | Six days at Disney requires comfortable clothing! I picked up an extra pair of these cropped leggings that I wear all of the time for working out and athleisure. The mid rise is perfect and they are super budget friendly! 6. Rose Gold Ears | And of course I had to have a new pair of ears for our trip! I found this cute shop on Etsy that creates custom ears. I picked matte ears with a rose gold bow! I can't wait to wear them! 7. 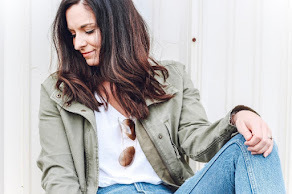 Boyfriend Plaid Shirt | With my outfit planning, I'm kind of treating the weather situation like a North Carolina fall and wearing removing layers. I'll be adding a flannel shirt or a pullover to my look everyday so I can wear it if necessary or try it around my waist when it's warm. 8. But First, Disney Tee | This tee is another great Etsy find! I love that it's pink! I'll be wearing this shirt on our first day in parks. Our first day will be at the Magic Kingdom and I cannot wait!